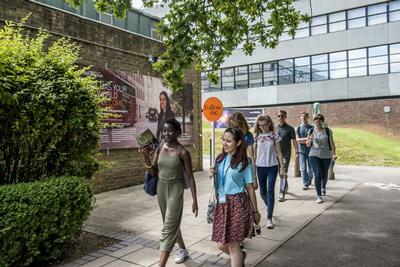 If you are not able to attend one of our Open Days or Visit Days, our Highfield and Avenue campus tours are a great opportunity to get a general overview of what it's like to live and study here, and to see our state-of-the-art facilities for yourself. Highfield is our main campus, where the library, student union and sports facilities are based. However. please check which campus your chosen subject is based at before booking a tour; we are a multi-campus university and not all of our facilities and subjects are based on the Highfield or Avenue Campuses. These tours are not subject specific therefore do not include visits to academic departments or buildings. Avenue Campus tours are for a subject specific tour of Archaeology, History, Film, English, Philosophy or Modern Languages and Linguistics. They last 30 minutes and are led by a student. You can take a virtual tour of Avenue Campus, or find out more on our Avenue Campus page. If you need more information, please do not hesitate to telephone us on +44 (0)23 8059 5900, or email visit@southampton.ac.uk. The phone lines are staffed from 08:00-17:00 GMT, Monday to Friday. Please note that we do not accept bookings via email or phone. Once booking for campus tours is open there will be a booking form available on this page.